Any time my hands are not on my keyboard my productivity is being harmed. Visual Studio + ReSharper has some really nice keyboard shortcuts which means I don’t need to use my mouse. However, one shortcut which just feels to me plain forgotten is being able to close a file using the keyboard. I can open, switch between but cannot close! 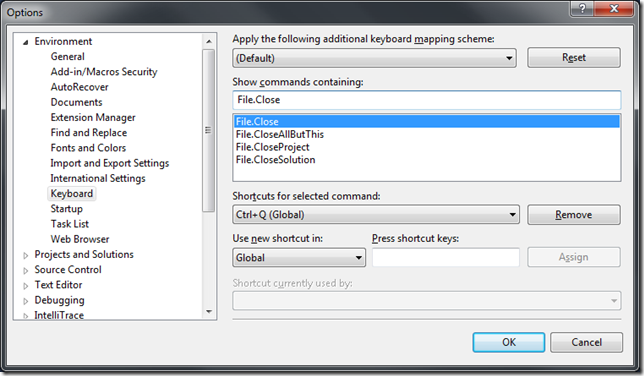 Thankfully you can bind your own shortcuts, as such I bound to Ctrl+Q. Having this simply makes everything a little bit easier. But please, Visual Studio or ReSharper – auto-bind this command. Note: Visual Studio 2010 Beta 2 is a bit buggy when it comes to keyboard shortcut. I had to un-assign anything bound to the key and restart the app before it took effect.